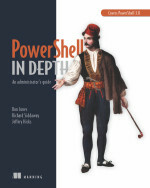 I’m very excited that the PowerShell books I’ve been working on this year will finally begin hitting the shelves, and hopefully your desk, over next month or two. I’ve you’ve been locked in the datacenter and have no idea what I’m talking about, you can check them out on my Books page. If you’ve already purchased a copy via Manning’s MEAP program or perhaps through one of the author bundles, a deep and sincere thank you. Book sales are a big part of my “business” and your support means I can continue doing even more. If any of these new books make their way to you, I would like to ask 2 things of you. First, books reviews on sites like Amazon are always appreciated so any honest and constructive feedback is appreciated. Second, I would love for you to take a moment and do an “unboxing” video clip. Capture the moment of revealing your new PowerShell purchase to the world. If you can, share why you bought the book and what you are hoping to learn from it. Then share your video clips with the community to help us spread the word. Thank you so very much in advance.